← Robert Hills O. W. S.
In this chapter we consider an artist who is famous for copying from other greats. William Forrest (1805-1899)is known for his landscape engravings. His best works are based on pieces by Chevalier, Church, Lorraine, Waterloo, and Allan. #WilliamForrest worked in both London and Edinburgh from where he established a healthy reputation for his landscapes and genre engravings. Perhaps his finest and most important work is ‘The Great Fall, Niagara’. It is surely his largest work. 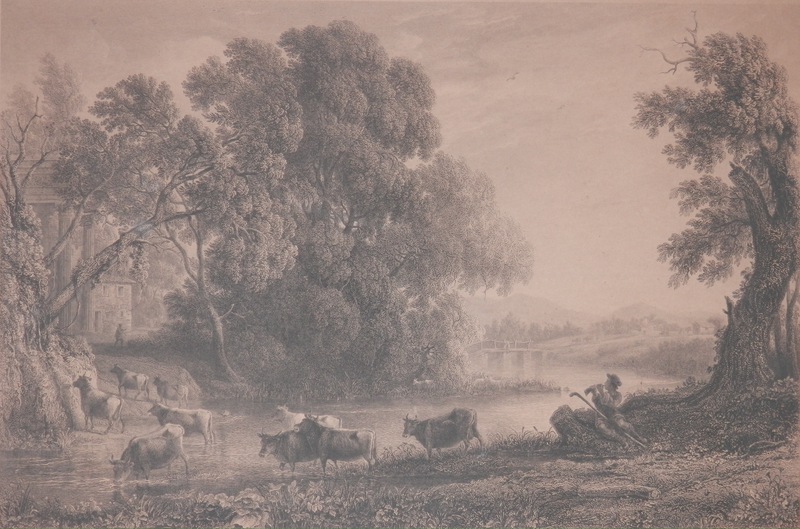 The engraving shown is titled #LandscapewithCattle,Evening and comes from a series called Engravings after the Best Pictures of the Great Masters. This image is plate 2 from the series. Forrest was also a contributor to a number of publications – The Land of Burns, and Memorials of Edinburgh in The Olden Time being two. Large scale engravings from the Victorian period and earlier are now becoming scarce and harder to find. Picture framers back then had no knowledge of conservation methods which lead to valuable works either being completely destroyed or unalterably stained and marred by their acidic mats and frames. Saying this, I recently went to a gallery to view a special exhibit of prints. They were wonderful and in pristine condition- and there was something lacking. I know that many of the pieces I find are imperfect but in many ways that is what gives them life makes them interesting. These pristine prints were perfect – they had not lived, been enjoyed, held, admired. Many a time, I find that age has improved the art in my collection but that is only my opinion. This entry was posted in Etching and tagged cattle, Claude Lorrain, farm boy, river, William Forrest. Bookmark the permalink. I have a small print of his. It is titled: Dobbs Linn underneath that is says: Moffatdale. It depicts a large mountain with a waterfall and what appears to be a religious person on the lower left side. Do you have any idea where it’s from? I cannot find any pictures of it online. I actually have a whole book of these old prints and don’t know what they are, historical significance or value? I do not provide valuations. I suggest you take your print to a local auction house for their experts to look at. Usually informal valuations are free but insurance valuations will be charged for. It will come down to the rarity and the quality of the print. Although prints are beautiful art pieces they are (in my mind) undervalued in the art world and by the public. Hope that helps and good luck with the valuation.